Finding a device to convert DC power to AC may seem like it should be a simple task, but when you start shopping for a power inverter for your RV or road trip vehicle, you'll soon find that many choices will confront you. With prices ranging from less than $40 to well into the thousands, it can be difficult to know what features are important and how to choose a unit appropriate to your needs. While wattage, features, and connections are obvious considerations, your final choice should take into account the inverter's wave form output. RV power inverters convert DC power from a battery source into AC power for small appliances. While an inverter won’t replace a generator or a city power connection for heavier electrical needs, inverters are an ideal solution for a bit of roadside current or AC power while driving down the highway. In considering a RV power inverter purchase the first question has to be, just how much power do I need? A small inverter pumping out 75 to 125 watts may be plenty for charging a laptop, a mobile phone, or even powering a few compact florescent lights, but it won’t deliver the wattage needed for your flat screen television, or the coffee maker. A 300 to 400 watt inverter may power a television, a desk fan, and several CFLs, but it can’t run your microwave. Inverters producing 600 to 800 watts are suitable for a range of small appliances. Inverters producing 1200 or more watts will power small heaters, refrigerators, or even a window air conditioning unit. There are two general types of power inverters: true-sine wave or modified-sine wave (square wave). True-sine wave inverters produce power that is either identical or sometimes slightly better to power from the public utility power grid system. The power wave when viewed through an oscilloscope is a smooth sine wave. Modified-sine wave and square wave inverters are the most common types of power inverters on the market. 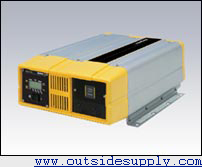 Modified-sine wave power inverters produce a power wave that is sufficient for most devices. The power wave is not exactly the same as electricity from the power grid. It has a wave form that appears as a choppy squared-off wave when viewed through an oscilloscope. What does that mean to the everyday user? Not much. Most household electrical devices will run perfectly fine on either type of wave form. Most of our customers who are using a power inverter to run a laptop, a/c cell phone charger, fan, or camera find that a modified-sine wave power inverter that operates through the cigarette lighter socket the easiest to use. We usually suggest choosing power inverters that are rated under 300 watts when using the 12-volt cigarette lighter socket found in most vehicles. We suggest this because after reaching 300 watts of draw on the inverter, the fuses in your car will begin to blow. 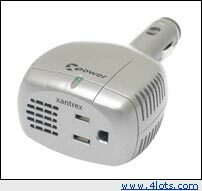 The xPower 175 Micro ($35.00) is a great choice for dashboarders who would like an easy solution to power their devices. It has only one outlet, but since plugging it into a 12 volt socket is all that is required for operation, it can't be beat for ease of use. This little inverter can supply 140 watts of continuous operation and has a built-in surge protector. equipment. Most of these connect via a 12-Volt plug. 600 watts ($100-$120): For household appliances, large screen TVs, 5-amp power tools, and bread machines. Most such inverters are connected directly to the 12-volt battery and have three or more grounded outlets for powering several products at the same time. 1750 watts ($199-$380): For household appliances, larger power tools, microwave ovens, toasters, and hair dryers. All of theses inverters are designed for direct connection to the battery network and can generally supply 1500 watts of continuous power. 3000 watts ($395-$750): With output power generally rated at 2500 watts for continuous load, these inverters can power virtually all household appliances and office equipment. For loads of this magnitude, special wiring and battery banks may be required. The problem with wave form only comes into play when specialized pieces of equipment need to be powered. Here are a few devices which could have problems when they are connected to an inverter producing a modified-sine wave signal: oxygen concentrators, fax machines, laser printers, high voltage cordless tool chargers, equipment with variable speed motors, electric shavers, and garage door openers. Thank you for visiting the Bruce Bernhart RV Websites!